Section 329 of title 11 United States Code is entitled debtor’s transaction with attorneys. This section gives the court oversight in financial as well as transactional relationships between debtors and their attorneys. It basically states that any attorney representing the debtor in bankruptcy shall file with the court a statement of the compensation paid for or agreed to be paid if such agreement was made after one year before the date of filing the petition. The statement must also list the source of the compensation and whether it is coming from the debtor or a third party. The court then has the ability under section 329 to determine whether that compensation exceeds the reasonable value of the services provided. The court basically has the power to cancel the agreement if it chooses, order the return of any excess funds it feels were charged as well as take other specific actions. Section 329 has been used by bankruptcy judges to curb misconduct on behalf of debtors’ attorneys as well. In addition to questioning the reasonableness of the fees being charged in the work being performed, judges will routinely schedule 329 hearings when they feel that the debtor may not have been represented properly. For example, if an attorney misses a scheduled court date such as a motion to modify the automatic stay or trustee’s motion to dismiss and the debtor appears, the judge will typically question where is your attorney? Have you spoken to your attorney? Do you feel that you have been adequately represented in this proceeding? If the judge does not like the answers that he hears from the debtor, the judge can schedule a 329 hearing to determine whether or not that attorney should be paid. If the judge feels that the attorney should not be paid, he or she can order the disgorgement of those fees back to the debtor or to the estate if this is an asset case. Sometimes the judge will set a section 329 hearing when there is no just cause. A recent example comes to mind. In a chapter 7 bankruptcy case, I brought a motion to withdraw after the 341 meeting of creditors simply because my client was non-communicative. Once I brought the motion, the client started to communicate. I then withdrew my motion to withdraw as I wanted to stay on the case. Despite the fact that I withdrew the motion and despite the fact that the debtor did not appear at the motion, the judge still set the matter for a 329 hearing. The attorneys in my office were wondering why the judge set such a hearing and what possible reason or thought could he have as to how we were not properly doing our job. As it turns out, the judge simply wanted to know what was going on with the case and proceeded no further. The key point here is for bankruptcy attorneys to realize that their fees are supervised and their conduct is supervised. 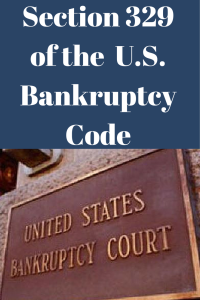 It may be from a judge pursuant to section 329 of the bankruptcy code or it could be from the United States Trustee’s office that also has oversight over bankruptcy attorneys, the fees they charge and the way they handle their cases before the court. If you’re doing honorable, prudent and honest work, you will not face much scrutiny from the judges or the United States Trustee. If, however, you run afoul of the basic systems and methods of handling bankruptcy cases in your jurisdiction, you are likely to encounter more 329 hearings than not.